Cut off from home, Princess Kelsey Bandar needs a place to hide from the vengeful Rebel Empire. The secrets she stole give her people a fighting chance in the war that brought down the original Terran Empire. If she gets them home. If her prisoners cooperate. Should that prove impossible, she must then convince a long-hidden people to help her. After she finds them, of course. 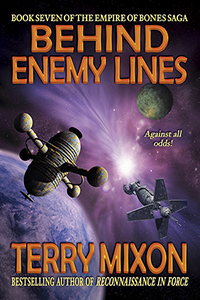 If you love military science fiction and grand adventure on a galaxy-spanning scale, grab “Behind Enemy Lines” and the rest of The Empire of Bones Saga today!